In order for organisations to become conducive to high performing teams it is crucial that managers have time and mental capacity to engage in complex problem solving. Unfortunately many organisations place an emphasis on starting work which diminishes managements capability of building a high performing organisation. To help managers free up time and mental capacity I’ve run an exercise with them called “Buckets”. In this exercise managers get to visualize and motivate why certain work needs to get done now and specifically by them. The bucket exercise also helps managers discover the work that needs to be delegated first. Ask the manager (or who ever you are running the exercise with) to list everything that is on their plate and that is expected of them to deliver. I usually ask the manager to use stickies and write down one item per sticky, but they can just as well use their personal notepad or write directly on a whiteboard. When the manager is done writing introduce the categories (or buckets) below and ask her to place out everything she listed in one of the four categories below. Also point out the limit. Don’t be alarmed if the manager lists well over 30 items or of someone claims that 10 items fit in category A. If that happens you can have them repeat step 2 but with those 10 items only. In that case, everything else falls under category D.
Next ask the manager to motivate why she specifically has to do everything in bucket A and B, and what will happen if they are delayed. Remember that this exercise is about creating focus – not about stopping work all together. Finally, move items between the different buckets to reflect the conversation you just have had, and as you discover more about the importance and urgency of specific work. When you’re done with these four steps the manager should come out with a list of work items to have. Here are two example of what the end result can look like. The first example is popular with managers who prefer to think in terms of bullets and lists, the second is preferred by managers who are visual story tellers. But you can visualize this in many different ways, the important part is to help the manager become more intentful. While some managers will be able to maintain a WIP limit after having done this exercise once other managers will struggle with creating and staying focused even after this exercise. In that case it might be helpful to facilitate this exercise with them on a regular basis possibly every third week. You can facilitate this with a management team and have people give feedback to each other. This way you can use it to build accountability towards one and other in the team. 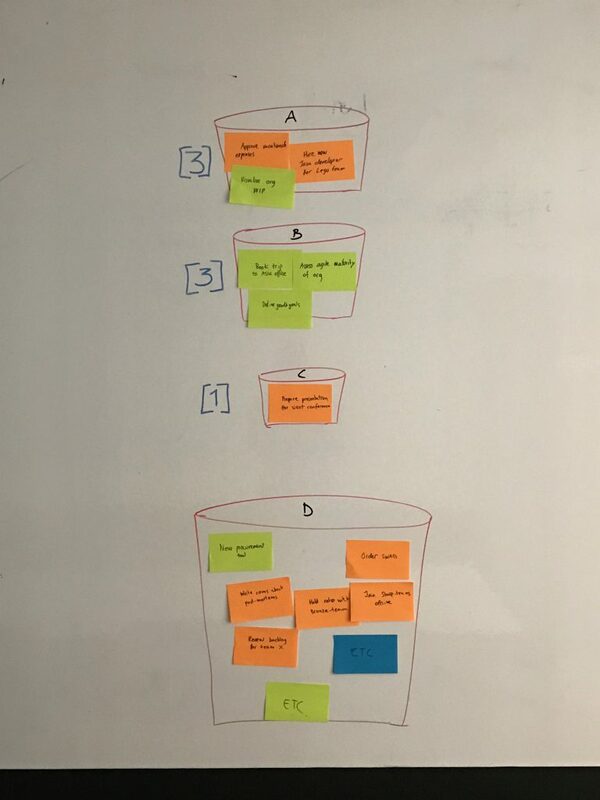 The buckets exercise is an opportunity for you as a agile coach or mentor to learn how the managers prioritizes work and for you to teach how to build, manage, and prioritize a personal backlog. Depending on if you are mentoring, coaching, or facilitating you might also get an opportunity to challenge decisions and adjust role expectations e.g. a manager focusing solely on product discussions, or only on growth of directs, or only focusing on the environment, etc. I hope this tool brings you value, and if you decide to try it or if you have another tool that has been helpful to you, please reach out and share your stories. I’d love to hear them! 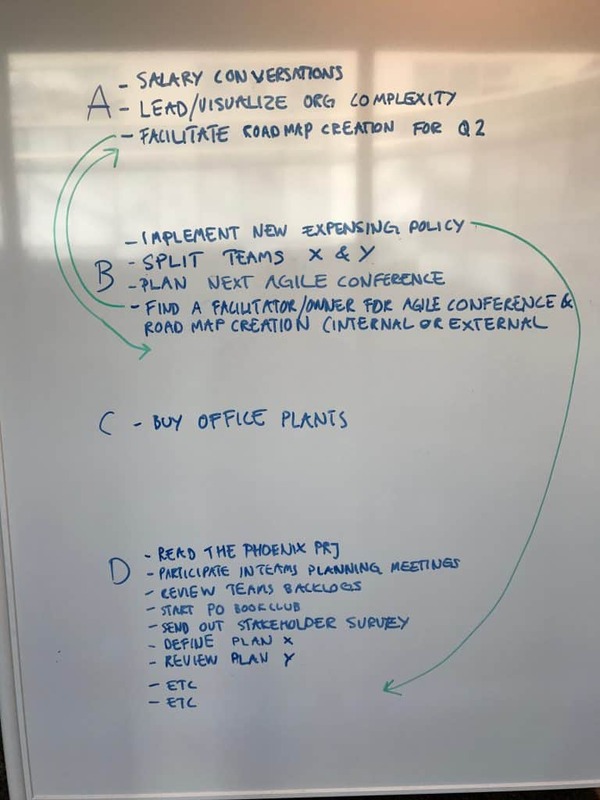 My manager taught me this tool 3 years ago when the demand for agile coaches in our org was higher than the availability and I found it very helpful. After the exercise I wanted to read more but I couldn’t find anything online so I decided to document how he ran it.